What Swedish hymn incorporates images of mothering Jesus? We may put on a brave face for our friends, keep a stiff upper lip for our families, and exude confidence in our workplaces, but sometimes we wish we could just lay it all down and rest, enfolded in a place of absolute love and security. 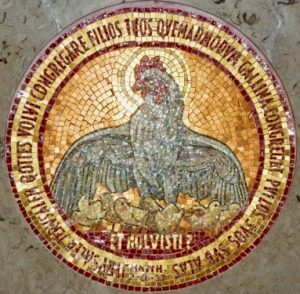 “THY HOLY WINGS, O SAVIOR” (1865) is a lullaby of comfort in which Jesus is likened to a mother hen, spreading her wings over trembling chicks. Trembling chicks — that would be us. 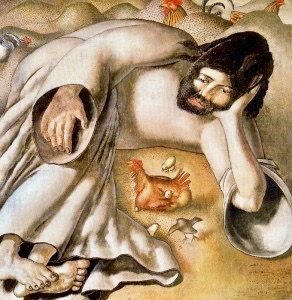 And if the hen image has too many feathers, here too is an image of the savior as a rock and hiding place. The author of this gentle hymn was Sweden’s Karolina (Caroline) Sandell-Berg (1832-1903). By age 23, she had two published books of poems, although she did not put her name on the collections. Her modest biography always features one central, life-changing event. 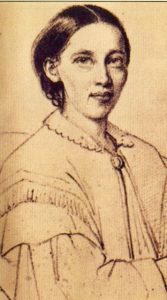 When she was 26, she accompanied her beloved father, Jonas Sandell, a Lutheran pastor in Fröderyd, on a ship crossing Lake Vättern. Midway, the ship bucked in the waves and Rev. Sandell fell overboard and drowned. Lina (as she was known) watched in horror, unable to rescue him. Her words were often sung at revival services throughout Scandinavian countries. Jenny Lind, the “Swedish Nightingale,” sang them in concert and helped finance their publication. Lina’s hymns were further promoted by guitarist Oscar Ahnfelt, Sweden’s “spiritual troubadour.” We are grateful to North Dakota-born Gracia Grindal (b. 1943) for translating this hymn into English. Two years after her father’s death, Lina married Oscar Berg, a merchant who eventually served in the Swedish Parliament. Although her last name is usually presented as Sandell-Berg, she initialed her hymns with L.S. Given her father’s drowning, it is a little surprising that Lina used the image of “Noah’s cleansing flood” as a positive image in this hymn. Still, a good bath before bedtime fits, with a mothering savior reminding us to scrub behind the ears before we are tucked in for the night. How little and safe we feel — just for now. It can be disconcerting if not downright embarrassing to admit that we long for a savior to cleanse us, tend us, mother us, protect us, loathing vulnerability as we do. Sometimes the only way to keep up our courage is to let down our defenses.